The Timeline editor, identified by a clock icon, is not much of an editor, but more used to view information and control animation playback. The Timeline is one of an animator’s most useful tools as it can give a broad overview of a scene’s animation. The Timeline can communicate the current time frame, either in frames or in seconds, where the keyframes are of the active object, the start and end frames of your animation, markers, etc. The Timeline has Player Controls, to play, pause the animation, and to skip through parts of the scene. It also has some tools for Keyframes, Keying Sets, and Markers. The main Timeline region displays the animation frames over time. The Timeline can be panned by holding MMB, then dragging the area left or right. You can zoom the Timeline by using Ctrl-MMB, the mouse Wheel, or pressing NumpadMinus and NumpadPlus. The Time Cursor is the green line, it is used to set and display the current time frame. The Time Cursor can be set or moved to a new position by pressing or holding LMB in the Timeline editor. The current frame or second can be displayed on the Time Cursor, check the View menu for settings. The Time Cursor can be moved in steps by pressing Left or Right, or in steps of 10 frames by pressing Shift-Up or Shift-Down. By default, the Playback/Rendering Range (Frame Start 1 to Frame End 200) is a lighter shade of gray. The start and end frame can be set to the Time Cursor by pressing S or E. The Playback Range can also be set by pressing P then drawing a box. For the active and selected objects, keyframes are displayed as a yellow line. For Armatures, the object keyframes and the pose bones keyframes are drawn. Only Selected Channels can be enabled. Timeline ‣ View ‣ Only Selected Channels. For Armatures, this will draw the object keyframes, and the keyframes for the active and selected pose bones. See the Markers page for more information. When you play an animation, the FPS is displayed at the top left of the 3D View. If the scene is detailed and playback is slower than the set Frame Rate (see Dimensions Panel), these options are used to synchronize the playback. Do not sync, play every frame. Drop frames if playback is too slow. (Audio/Video Synchronization). Sync to audio clock, dropping frames if playback is slow. If your animation has sound, this option plays bits of the sound wave while you move the time cursor with LMB or keyboard arrows (like a moving playhead). Mute the sound from Sequence Editors. Don’t allow selecting frames outside of the playback range using the mouse. Animation editors can be setup to always follow the time indicator as animation is being played back. Following will be done when animating and changing frame. When the cursor reaches the end of the screen, the next range of frames of the same width will be displayed. While playing, updates the Timeline, if Animation Editors and All 3D View Editors disabled. While playing, updates the 3D View and the Timeline. While playing, updates the Timeline, Dope Sheet, Graph Editor, Video Sequence Editor. When the animation is playing, this will update the property values in the UI. The UV/Image editor in Mask mode. While playing, updates the Video Sequence Editor. While playing, updates the Node properties for the Node Editor. While playing, updates the Movie Clip Editor. Keying Sets are a set of keyframe channels in one. They are made so the user can record multiple properties at the same time. 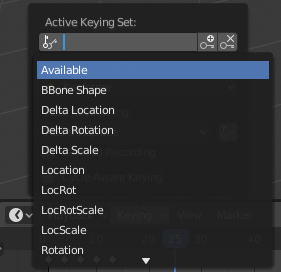 With a keying set selected, when you insert a keyframe, Blender will add keyframes for the properties in the active Keying Set. There are some built-in keying sets, LocRotScale, and also custom keying sets. Custom keying sets can be defined in the panels Properties ‣ Scene ‣ Keying Sets + Active Keying Set. Insert keyframes on the current frame for the properties in the active Keying Set. Delete keyframes on the current frame for the properties in the active Keying Set. This controls how the auto keyframe mode works. Only one mode can be used at a time. Add or replace existing keyframes. When enabled Auto Keyframe will insert new keyframes for the properties in the active Keying Set. Adds a new NLA Track and strip for every loop/pass made over the animation to allow non-destructive tweaking. The View Menu controls what you see, and what it looks like. Whether to show the time in the X axis and the Time Cursor as frames (based on the FPS) or as seconds. This will draw the current frame or seconds on the Time Cursor. For Armatures, this will draw the object keyframes, and the keyframes for the active and selected pose bones. Softbody, Particles, Cloth, Smoke, Dynamic Paint, Rigid Body. Maximize the area based on the Animation Range. Centers the Timeline to the Time cursor. This is used to switch cameras during animation. It binds the active camera to the selected markers. First select a camera. Then select the marker(s). Then use the tool. 1. Range Control, 2. Frame Control, 3. Player Control, 4. Synchronize Playback, 5. Keyframe Control. This is an alternative range used to preview animations. This works for the UI playback, this will not work for rendering an animation. See Preview Range. The start frame of the animation/playback range. The end frame of the animation/playback range. The current frame of the animation/playback range. Also the position of the Time Cursor. These buttons are used to set, play, rewind, the Time Cursor. This sets the cursor to the start of frame range. This sets the cursor to the previous keyframe. This plays the animation sequence in reverse. When playing the play buttons switch to a pause button. This plays the animation sequence. When playing the play buttons switch to a pause button. This sets the cursor to the next keyframe. This sets the cursor to the end of frame range. The record button (red dot) enables something called Auto Keyframe: It will add and/or replace existing keyframes for the active object when you transform it in the 3D View. For example, when enabled, first set the Time Cursor to the desired frame, then move an object in the 3D View, or set a new value for a property in the UI. When you set a new value for the properties, Blender will add keyframes on the current frame for the transform properties. Other use cases are Fly/Walk Mode to record the walk/flight path and Lock Camera to View to record the navigation in camera view. Note that Auto Keyframe only works for transform properties (objects and bones), in the 3D Views (i.e. you can’t use it e.g. to animate the colors of a material in the Properties editor…).